Let’s be honest: I’m being polite here. The title really should read The Calendar in the Toilet but for some reason I didn’t think that set quite the right tone. It could also have been The Calendar That Isn’t The One Hanging In The Kitchen but that’s just bordering on the obscure for those of us who don’t live in my house, which is pretty much everyone reading this. But let’s stop focussing on what could have been and focus on what is, namely, the traditions of this house. Traditions such as Thou Shalt Not Cook Bacon Unless Everyone’s Getting Some (which tradition is broken by my sister-in-law on a regular basis); Thou Shalt Not Jump Onto The Bench And Lick The Butter (which tradition only applies to one of our cats… I hope); and last, but not least, There Shall Always Be Two Calendars. Yes, always two. In yet another tradition, my mum always gives us a cat calendar for Christmas and this one hangs in the kitchen, adding yet another touch of catness to the house. 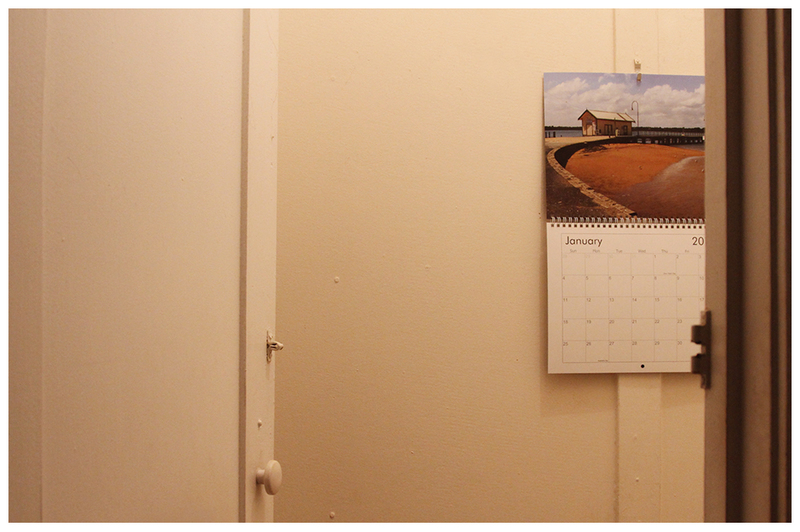 The second calendar lives in the bathroom and usually features photographs of interesting locations and landscapes. I have to buy this one myself but never fear – I always buy it after the new year when calendars are on special. This year, however, this calendar purchase didn’t occur and days went by with bathroom visitors being forced to look at December 2014 in outright defiance of the fact that it was actually January 2015. Oh, the vague irritation of it all! But there was nothing for it: I hadn’t found a calendar that was either pretty enough or cheap enough. When I saw some calendars on ‘special’ for $13, I had a brainwave (although it was disguised as annoynace at the time). “I could make a calendar for less than that!” I said, although not out loud, because people tend to give you strange looks when you start talking to yourself in shops. No imagination, that’s their problem. The idea took hold, though, and a little later, I was browsing about to see if it was worth my while to make my own calendar. A little later than that, I was browsing through my albums of photos, collecting images to edit and arrange and, eventually, compile into my personalised bathroom calendar for 2015. I ordered it on Tuesday night. On Friday night, I received an email saying it had been shipped and when I got home, I discovered it had already arrived, five days before the estimated arrival date. Now that is some speedy service. Best of all, visitors to the bathroom are now bang up to date. It looks like there’s a new tradition in this house: Thou Shalt Make The Bathroom Calendar Thyself. Thanks, I Made it Myself! Now I want to visit your loo. I used Vista Print and the postage cost as much as the calendar itself, which hurt a little. In the past, I’ve used Officeworks and chosen the option to pick it up in store, as there are two quite close to me. Even with the postage, Vista Print was still cheaper than Officeworks and I’m quite happy with the quality. Exactly! It’s always nice to have something to look at while you’re in there, which is why I usually choose landscape or location calendars. Having my own photos there makes it even more enjoyable! Calendars are all about the prettiness for me; the dates are only useful when I’m on holiday and have absolutely no idea what day of the week it is. What a crappy place for a calendar…. Ohhhhh is funny ’cause is true!